Biotechnology has advanced rapidly in Iran in the past two decades. Pharmaceutical biotechnology has advanced to a degree that we are exporting Pharmaceutical abroad including Europe. There have been contracts for tech transfer to other countries. Iranian progress in this field has amazed others in the west. For this we are proud to announce the upcoming Biotechnology Congress to be held in Karaj, Iran in 2017. The Second International and 10th National Biotechnology Congress will be held from 29th to 31th August, 2017 in Karaj, Iran. The congress is hosted by the Biotechnology Society of the Islamic Republic of Iran. 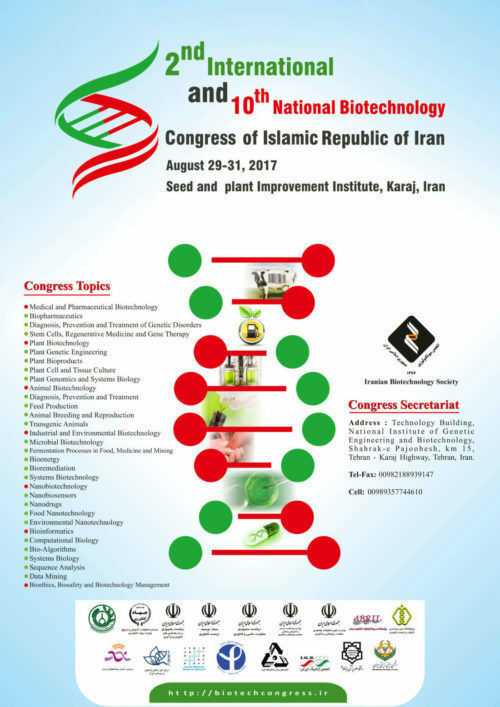 On behalf of the Biotechnology Society of the Islamic Republic of Iran, the Organizing Committee invites researchers in the field of Biotechnology (Plants, Agriculture, Animals, Human, Biotech Industry, Microorganisms, Ethics, Rules and Regulation, Standards, Guidelines and other related topics) to participate in the First International and 10th National Biotechnology Congress. The conference program will include invited speakers, oral communications, and poster presentations. The congress will be an excellent opportunity to hear top level speeches, talks, discussions, presentations by top level guests or invited speakers from Iran and the world. This also provides excellent moments to show and discuss your latest results on different aspect of biotechnology orally or as posters. There will be B2B Opportunities and site visits for those interested. The conference venue is Seed and Plant Improvement Institute, Karaj, Iran.